San Shou EXPLODES In San Jose, CA, USA! Cung Le Becomes First IKF San Shou World Champion... While Jedeepitak, Ott, Madigan, Soto and Castillo All Win Their Title Bouts On "UNITED FOR THE CHILDREN" Event! Last Saturday night, December 15th, UsH! Entertainment and G-Up Promotions hosted UNITED FOR THE CHILDREN. A Benefit Event for the The Twin Towers Orphan Fund and the Marine Toys for Tots Foundation at the San Jose Event Center in San Jose, California, USA. A crowd of about 1,500 were treated to a great night of San Shou Style fighting which featured 12 San Shou fighters from East to West fighting for 6 IKF San Shou Titles. The Main event of the night featured the top ranked San Shou Fighter in the Nation, Cung Le San Jose, California, USA against top UFC competitor Shoni Carter of Chicago, Illinois, USA. This was a great bout that saw two warriors going at it toe to toe. Unlike some of Le's former opponents, Carter was much stronger and wasn't allowing Le any easy throws as we've seen in past bouts. Carter was strong in the clinch and had plenty of weapons from the outside as well. It was sure to be a true test of Le's fighting skills as well as Carters. In the opening seconds of round 1, the two banged heads which resulted in a cut over Le's right eye. Immediately the cut started to bleed quite a bit which brought a worry to everyone at ringside, wondering if the ringside doctor was going to request the bout be stopped early due to an accidental injury. If so, the bout would have ended in a "No Contest", but this was not to be on this night. As the round ended, Le's corner did an excellent job of sealing the cut to insure the bout would continue. The first round saw Le ahead in total points on the 3 judges cards. Judge Jon Schorle scored it 18-10. Judge Susan Thomas Gitlin scored it 31-17 and judge Marcos Rosalas scored it 17-4. NOTE: San Shou scoring is a lot like Amateur Boxing. Each strike that a judge sees as a scoring blow (Kick or Punch) the judge clicks a point on his/her judges clicker. Throw points are also added to the striking points. The throw points are awarded by the referee after each throw. Throw points are 1,2 or 3. All of these points make up the final round score. With this system, there will always be a vast difference in "Counted" points at the end of a round. In final scoring, only 1 point is awarded after each round which goes to the fighter with the highest point total. In round 1, Cung Le won on all 3 judges cards so he lead on all 3 judges cards 1 round to 0 after round 1. In round 4 we saw a lot of the same. Carter continued his stand-up striking and tried to get at Le's cut over his right eye, landing a few good shots here and there. However, the points in the throw category continued to make all the difference as Le won round 4 with ease. Judge Jon Schorle scored it 14-7. Judge Susan Thomas Gitlin scored it 30-19 and judge Marcos Rosalas scored it 10-3. In the final round the two continued the same pace. Carter still failed to score any throw points and managed little in the stand-up game as Le scored in both stand-up as well as throws. Although Carter was a strong opponent for Le, he was no match for Le's throwing skills. He was able to continue standing both times Le attempted his famous Scissor Sweep takedown but wasn't able to counter some of Le's other throws. At the end of the 5th, Le again won on all 3 judges cards. Judge Jon Schorle scored it 10-5. Judge Susan Thomas Gitlin scored it 27-14 and judge Marcos Rosalas scored it 19-5. In the end, Le won on all 3 judges cards 5 rounds to 0 to be the first to capture an IKF San Shou World Title in the ring. Carter proved to be one of Le's toughest opponents. Although he didn't have the throwing skills to match Le, his heart and toughness kept him strong throughout all 5 rounds. Great fight by both! The Semi Main Event lost some of it's hype when IKF MT & IR World Champion Danny Steele (Left) of Los Angeles, CA, USA didn't make the weight cut off of 147 lbs for the vacant IKF San Shou Welterweight World Title. Steele made 149.5 but was unable to drop any more as he was nursing a groin injury he had suffered about 4 weeks ago. Because of this, Matee Jedeepitak (Right) of Ratchaburi, Thailand via Indianapolis, Indiana, USA was awarded the World Title by forfeit. However, both fighters agreed to fight anyway to assure some excitement for the event. In round 1, Steele was hit in the head with a knee strike by Jedeepitak which dropped him to the canvas. Referee Marcos Rosalas didn't see the knee and gave Steele an 8 count instead. (Knees were not legal in any of these bouts) As if that wasn't enough to slow Steele down, he also re-injured his groin at the end of the round when he threw a kick. However, as many know, Steele wasn't about to have the injury stop him. Steele tried his best to fight toe to toe with Jedeepitak but it was not meant to be. Unable to move at will Jedeepitak picked his shots against Steele and landed them wherever he wanted to. After 1 the scores were, Judge Jon Schorle scored it 28-27 for Steele. Judge Susan Thomas Gitlin scored it 47-11 for Jedeepitak and judge Dan Stell scored it 29-8 for Jedeepitak. Round 2 started strong as Steele tried to put more pressure on Jedeepitak. However Jedeepitak exploded back with an attack of his own. Picking his shots from a simple jab to explosive leg kicks, these two wouldn't get into any kind of Throwing game, but the stand-up action was explosive when they mixed it up. As round 2 continued the two seemed to do more standing around than fighting. Playing a waiting game to see who would commit first. When they did Jedeepitak seemed to always come away with the best. As in the Draka style of fighting Steele fought in the mid 90's, the "Point System" once again hurt Steele as his activity wasn't anywhere near Jedeepitak who scored and scored often with his hands and feet. In round 2, judge Jon Schorle scored it 17-9 for Jedeepitak. Judge Susan Thomas Gitlin scored it 25-14 for Jedeepitak and judge Dan Stell scored it 18-8 for Jedeepitak. As the rounds progressed, it all looked the same. Although Jedeepitak was making a name off an injured Steele, the fact was, HE WAS MAKING A NAME! Everyone was impressed at his skill and technique. After round 3, judge Jon Schorle scored it 20-10 for Jedeepitak. Judge Susan Thomas Gitlin scored it 31-11 for Jedeepitak and judge Dan Stell scored it 22-9 for Jedeepitak. After round 4, judge Jon Schorle scored it 15-6 for Jedeepitak. Judge Susan Thomas Gitlin scored it 28-9 for Jedeepitak and judge Dan Stell scored it 14-6 for Jedeepitak. When round 5 came around, Jedeepitak didn't want to leave any doubt in the judges minds or the fans. Steele was an injured animal with very little movement and Jedeepitak was out for his prey. He exploded with kick and punch combinations scoring at will and impressing everyone. After round 5, judge Jon Schorle scored it 25-5 for Jedeepitak. Judge Susan Thomas Gitlin scored it 37-7 for Jedeepitak and judge Dan Stell scored it 25-3 for Jedeepitak. When it was over, the IKF had no problem crowning Jedeepitak the IKF San Shou World Champion. What we would like to see though is 2 things. 1, a rematch with a healthy Steele, but more important, for Jedeepitak to challenge IKF World Champion Khunpon (right) for his IKF MuayThai Rules Welterweight World Title. This would be a Great Match-up! Before the two Pro World Title bouts was the challenge for the vacant IKF Pro San Shou Intercontinental Title between IKF Pro US San Shou Middleweight Champion Rudi Ott (Left) of San Jose California, USA against Peter Kaljevic (Right) who was born in Montenegro, Yugoslavia but currently resides in New York City, New York, USA. This bout was a strong match for both fighters. However, Ott, as Le in his bout, proved to have all the throwing skill in this match-up. Kaljevic entered the match with plenty of experience having a record of 47 wins, 15 loses with 18 wins coming by KO or TKO. He also proved to have a heavy right hand as well, but in comparison, Ott proved he had a chin as solid as a rock. On several occasions, Ott dropped his left hand and Kaljevic saw the opening and went for it, landing several times. However Ott never staggered and answered back with a sort of "That was a good shot" smile but take this as he threw Kaljevic around the ring. After round 1, judge Jon Schorle scored it 20-6 for Ott. Judge Susan Thomas Gitlin scored it 45-11 for Ott and judge Marcos Rosalas scored it 29-7 for Ott. This fight was clearly the "Rudi Ott Show" as he used nearly every throw in the book scoring often as if Kaljevic never knew a counter. At the end of round 2, the judges scored the round, judge Jon Schorle 29-12 for Ott. Judge Susan Thomas Gitlin scored it 41-21 for Ott and judge Marcos Rosalas scored it 18-6 for Ott. In round 3, judge Jon Schorle scored it 32-10 for Ott. Judge Susan Thomas Gitlin scored it 39-13 for Ott and judge Marcos Rosalas scored it 23-7 for Ott. In round 4, judge Jon Schorle scored it 20-11 for Ott. Judge Susan Thomas Gitlin scored it 31-16 for Ott and judge Marcos Rosalas scored it 20-12 for Ott. In the final round 5, judge Jon Schorle scored it 15-7 for Ott. Judge Susan Thomas Gitlin scored it 20-11 for Ott and judge Marcos Rosalas scored it 17-5 for Ott. This was Rudi Ott's title to win and he did so with a strong effort. Although the scores didn't sound close, Kaljevic made a great fight out of it. In the win, Ott was awarded the vacant IKF Pro San Shou Intercontinental Title. Before the Pro bouts were 3 IKF Amateur San Shou Title Bouts. Brian Madigan defeated Brian Kuhn by majority decision. Although Santos Soto (Right, 11-2/8, 151, 5'9", 17) of San Jose, CA, USA came in under the title weight limit of 153 lbs, the fight continued and he went on to defeat Chris Overby (13-2/7, 157, 5'9) of Bellefontaine, Ohio, USA by TKO at 1:55 of round 3 to claim his second IKF Amateur San Shou U. S. Title. Jenna Castillo (Below - Left, 7-0, 5'5, 123, 19) of San Jose, CA proved once again that she IS THE WOMAN OF SAN SHOU! Castillo successfully defended her title and continued her undefeated streak by defeating Christine Yandolli (9-3/0, 5'7, 20, 123) of Smithtown, Long Island, New York, USA by unanimous decision. NOTE: To respond to some of the fans comments about the IKF not having a belt to present toCastillo after her win, the reason was because her camp forgot to bring the Title Belt she was defending to the ring. This was not the fault of the IKF. Ush Entertainment has announced that they would like to promote 3 San Shou style events for the 2002 season. If all are as exciting as this one, we all look forward to seeing more. For more info on this event, please contact Monica Ortiz at (415) 643-9109 or by e-mail at; monica@unitedforthechildren.com. Net proceeds from United for the Children are being donated to the US Marine Corps' Toys for Tots Foundation and the The Twin Towers Orphan Fund. Toys for Tots has been a fixture in holiday charity for needy children since 1947. Although more recently founded, The Twin Towers Orphan Fund is a volunteer organization founded to support the orphaned children of the September 11th rescue workers and victims. All funds are being independently handled by the San Francisco CPA firm Shea, Labagh, Dobberstein. it will not matter. . .
or what my clothes looked like. . . This Saturday night, December 15th, Cung Le's UsH! Entertainment and G-Up will Present UNITED FOR THE CHILDREN. A Benefit Event for the The Twin Towers Orphan Fund and the Marine Toys for Tots Foundation at the San Jose Event Center in San Jose, California, USA. There will be 3 Elements that will make this a very special night for everyone. Of course the IKF Title Fights are an element we like to talk about in this article and we will, but probably the most important part is who will benefit from this great event, The Children. The third element that makes this such a special night will be all the individuals involved. The United For The Children (UFTC) event will combine some of the world's best martial artist with Hip Hop sounds and Hollywood style staging. Ush Entertainment has brought together not only some great kickboxing action ("The American Fight Sport") but also some of the areas best DJ's, hip hop dancers and R & B singers who have prepared quite a show. Unlike a lot of fund-raising Benefits, UFTC will be donating 100 percent of the event net proceeds to The Toys for Tots Foundation and The Twin Towers Orphan Fund. Everyone in the USA as well as around the world has been touched by our national crisis and are aware that holidays are the hardest time for children in need. Because of this, UFTC has organized this event as a way of providing needed funds for the Children at the Holidays. The Main Event will feature San Shou Superstar Cung Le of San Jose, California, USA against Shoni Carter of Chicago, Illinois, USA. Le's, who's impressive career includes being a Light Heavyweight World Champion and Three Time Captain of the US National San Shou Team has been considered by many as one of the greatest fighters on the planet. On the other side of the ring will be UFC's #2 Ranked Middleweight and former Collegiate All-American Wrestler, Shonie "Showtime" Carter. The two will be fighting for the vacant IKF (International Kickboxing Federation) Light Heavyweight San Shou World Title. Both Le and Carter are 29 years old. Le stands 5'10" to Carter's 5'9". Both plan to weigh in at about 177 lbs. Le's "Overall" fight record is 38 wins and 2 loses with 26 of his wins coming by KO or TKO. Carter's record is 40 wins with 7 loses and 16 wins coming by KO or TKO. Le's fierce style and athletic prowess is catapulting him and "The American Fight Sport" into the mainstream, prompting Black Belt magazine to proclaim him "San Shou Kung Fu's Top Fighter" in January 2001. Carter is a fighter with power, versatility, and style and is known for his over the top, in-your-face bouts with the toughest competitors in the UFC. The other co-Main Event will be for the vacant IKF Pro San Shou Welterweight World title and will feature 2 Time IKF World Champion Danny Steele against #1 IKF Ranked Matee Jedeepitak of Indianapolis, Indiana, USA, via Ratchaburi, Thailand. Steele, who was Born in Saigon, Vietnam and raised in Hawaii currently lives in Los Angeles, California, USA and has a fight record of 37 wins with 9 loses and 2 draws with 28 of his wins coming by KO or TKO. He's obviously one of the best fighters on the planet with knockout power in both hands and leg kicks that could drop a tree. His skill has earned him a total of six world titles in five weight divisions and a nickname to go along with his proven toughness, Danny "Hard As" Steele!. Steele's opponent on the other side of the ring will be top contender Matee Jedeepitak who sports an extensive record of 123 wins with 52 loses, with 38 of his wins coming by KO or TKO. He's ranked #1 in the world in the IKF MuayThai Welterweight division and a former Featherweight World Champion. He's been considered one of Thailand's best fighters. His nickname "Left Dragon Leg" was coined after the many knockouts he has delivered with that leg. Steele is 32 years old, Jedeepitak is 29. Both stand 5'7" tall and plan to weigh-in at 147 lbs. these are two "POWERFUL" leg kickers and because of this, we may not see a lot of throwing in this bout. Before the two Pro World Title bouts will be a Pro Intercontinental Title between IKF Pro US San Shou Middleweight Champion Rudi Ott of San Jose California, USA against Peter Kaljevic who was born in Montenegro, Yugoslavia but currently resides in New York City, New York, USA. Ott's overall fight record is 25 wins, 3 loses with 7 wins coming by KO or TKO. Kaljevic has a record of 47 wins, 15 loses with 18 wins coming by KO or TKO. Ott is a Three time member of US the USA National San Shou Team and the Current Captain of the US National San Shou Team. He's a versatile and dangerous fighter who has solidified himself as one of the best in the USA. Saturday night he hopes to take another step towards proving he's one of the best in the world, but Kaljevic's extensive ring experience will be his strong point in his attempt to make the headlines in Ott's hometown. The event will also feature 2 US National Team members and IKF U.S. San Shou Champions, Santos Soto (Left -IKF Amateur U.S. San Shou Super Welterweight Champion) and Jenna Castillo. (Right - IKF Amateur Woman's San Shou U. S. Bantamweight Champion. 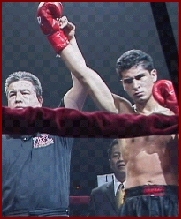 Soto's was first booked to fight challenger Arturo Ortiz but Ortiz suffered a broken hand in training last week. A quick fix was made when Chris Overby of Bellefontaine, Ohio, USA (13-1/7, 5'9) accepted the bout just today. A special thanks goes out to Chris for saving this bout. The two will be fighting for the vacant IKF Amateur San Shou Light Middleweight U.S. Title. At only 19, Jenna Castillo will be defending her IKF US Amateur Title is already making her mark as one of the best young female fighters in the United States. Her strength in the ring center around her fierce competitiveness and her unflinching focus on her opponent. 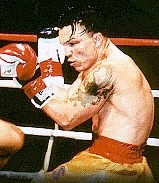 Castillo, (6-0, 5'5, 19) is a 1999 Pan American Game Competitor and member of the US National San Shou Team. She will face challenger Christine Yandolli (Left, 9-2, 5'7", 20) of Smithtown, Long Island, New York, USA has won an Amateur World Title, the USKBA North American Title, Tri-State Title, New York State Title and a Long Island title. The other element that will make this event such a great "SHOW" will be the stars who are involved. We won't give out the guest list but expect to see some very well known faces at ringside. The halftime show that is being produced by Hip Hop.com and the International Turntablist Federation promises to be just as star-studded as the nights fight action, featuring New York's Hip Hop dance legend Crazy Legs and the Rock Steady Crew and music's top DJs Apollo, Vin, and Ajaxx. In addition will be D'Wayne Wiggins, (Right) top neo-soul/R&B vocalist, composer, arranger and producer who will be headlining the halftime show. Wiggins' career has taken him to the top of the music charts with platinum selling albums as a founding member of the legendary group Tony, Toni, Tone and recently with his solo debut "Eyes Never Lie," which included collaborations with Carlos Santana and Darius Rucker of Hootie and the Blowfish. Wiggins was responsible for originally signing multi-platinum artist Destiny's Child to Columbia records and has written and produced several songs for the group. An accomplished and sought after musician, songwriter, and producer, Wiggins has composed hits for Tony Toni Tone, Jody Watley, Tevin Campbell, Karyn White, Too Short, Lighter Shade of Brown, E-40, Richie Rich, and most recently Destiny's Child, India Arie, and Alicia Keys. As a member of the Tonyies, Wiggins co-wrote movie tracks for "Boys in the Hood," "Beverly Hills Cop III," "The Mask," and "Panther." As a soloist, his soundtrack credits include songs for "Sugar Hill," "Men in Black," and the TV comedy hit "Living Single." He now adds Movie Producer to his list of titles, as Executive Producer for the feature film "Me & Mrs. Jones". The film is scheduled for release in 2002 and stars Brian White, Wandachristine, Victor Williams, and Kim Fields. Considered the creator of "neo-soul", Wiggins deftly combines classic soul vocals, a live band, and a distinct lack of studio-created sounds, making his on-stage performances very personal, unique experiences. His performance is going to be the highlight of United for the Children. Tickets for United for the Children are available through Bass and Tickets.com. Donations and sponsorships are also available via www.unitedforthechildren.com/sponsors.html or email sponsors@unitedforthechildren.com. There will be a registered press-only press conference and weigh-in the day before United for the Children. Press registrations are complimentary for qualified media representatives and gives you access to all events and the show floor. Contact monica@unitedforthechildren.com for more information. For MORE info about this Great event and all involved, Click HERE! FIGHT CARD & FIGHTER INFO CLICK HERE! San Jose, CA, November 13, 2001: G-Up Corporation, Kickboxing sensation Cung Le, and UsH! Entertainment announced today their collaboration on the holiday charity extravaganza, United for the Children, a benefit event for the Marine Toys for Tots Foundation and the Twin Towers Orphan Fund. United for the Children, to be held in the San Jose Event Center in San Jose, California on December 15, 2001, combines the world's best martial artist with Hip Hop sounds and Hollywood style staging. United for the Children is going to be a terrific event for the Bay Area. We've assembled the best kickboxers, DJ's, hip hop dancers and R & B singers, and they are preparing quite a show," said Cung Le, (Left) Martial Arts Superstar and event organizer. "We are also very pleased to be donating 100 percent of our event net proceeds to The Toys for Tots Foundation and The Twin Towers Orphan Fund. We've all been touched by our national crisis and are aware that holidays are the hardest time for children in need. This is our way of giving a little back." 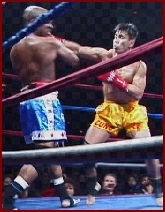 Cung Le, whose impressive career includes being a Light Heavyweight World Champion and considered the greatest fighter on the planet, headlines the event competing against UFC's Shonie "Showtime" Carter (Above Right) for the IKF (International Kickboxing Federation) Light Heavyweight World Title. The event also features five other IKF championship level matches. Before the two Pro World Title bouts will be a Pro Intercontinental Title between IKF Pro US San Shou Middleweight Champion Rudy Ott of San Jose California, USA against Peter Kaljevic who was born in Montenegro, Yugoslavia but currently resides in New York City, New York, USA. At only 19, Jenna Castillo will be defending her IKF US Amateur Title is already making her mark as one of the best young female fighters in the United States. Her strength in the ring center around her fierce competitiveness and her unflinching focus on her opponent. Castillo, (6-0, 5'5, 19) is a 1999 Pan American Game Competitor and member of the US National San Shou Team. She will face challenger Christine Yandolli (9-2, 5'7", 20) of Smithtown, Long Island, New York, USA has won an Amateur World Title, the USKBA North American Title, Tri-State Title, New York State Title and a Long Island title. The half time show being produced by Hip Hop.com and the International Turntablist Federation promises to be just as star-studded, featuring New York's Hip Hop dance legend Crazy Legs and the Rock Steady Crew and music's top DJs Apollo, Vin, and Ajaxx. "G-Up is always ready to support Cung and his projects," said Dominique Nguyen, G-Up Corporation President and CEO. "United for the Children is going to be a terrific showcase for his talents and his unfailing commitment to our community. The fact that this is a charity event is no accident as Cung has always demonstrated his affection and concern for all children in need." "We here at the IKF are doing all we can for this great event." said IKF President Steve Fossum. "This is an opportunity for us to get involved and help those in need around the world and we're proud to be a part of it. The tragedy of September 11th touched us all and was a true wake-up call for all of us. Not just in making us more aware of violent acts around the world, but in bringing our attention to the many others around the world who need help as well. It should be everyone's duty to help those in need around the world which is why for this event, we made it ours." The Twin Towers Orphan Fund is a volunteer organization founded to support children of the victims and rescue workers who lost their lives in the Pentagon, the World Trade Center, and on the American Airlines and United Airlines flights. In addition, it welcomes any children affected by the Anthrax scare and military action in the Afghanistan. Children registered with the fund are assured continued access to educational opportunities, a loving home, and peace of mind as they struggle to make sense of their losses. Founded in 1947, Toys for Tots is the US Marine Corps' premier community program. From October to December, Toys for Tots collects funds and new toy donations on both local and national campaigns. To date it has distributed over 272 million toys to 133 million needy children. They have become a nationally recognized symbol of the holidays for parents and children alike. The IKF has donated All of the Sanctioning Fees for this great event. We hope your able to donate something as well. Being ranked number 1 in the IKF Pro San Shou Division has never been enough for Cung Le. His hopes are to move out of the numbered rankings and into the solid IKF World Champions Position. A world-class fighter, martial artist and three time world champion in other San Shou organizations, the 28 year old Le is still in his prime and he's already made a tremendous impact on martial arts. His popularity as a fighter has brought San Shou Kung Fu to the forefront of the fight world and is catapulting Le into the main stream. "The biggest name there was Cung Le, pound for pound the toughest most complete hombre this side of Roy Jones Jr."
This statement is supported by Martial Arts Illustrated's June 2000, Best Fighters of All Time issue that featured Le on the cover. He has also been on the cover of every major Martial Arts publication multiple times during the last five years. As a testament to Le's ability, he proves the credibility of his technique and skill by knocking out his competition on ESPN2 StrikeForce events as well as Pay-Per-View ës such as the DRAKA Championships and Shidokan, The Triathlon of Martial Arts. Le, the U.S. Team Captain at the World Martial Arts Championships in Italy in 1997 and Hong Kong in 1999, possesses a record of 38-2, with 26 wins by knockout. With Sanshou's fast paced style where unlike boxing, a fighter is penalized for non- engagement or resting, Le is an ominous presence with the ability to knock someone out with both hands and as well as both feet. The subject of a documentary that chronicles his life "Cung Le, The Making of a Champion", begins with Le as a child in Vietnam, follows him as a wrestler in college and takes you ringside for his many hard fought victories. The film also takes you behind the scenes to see the type of grueling training that makes a champion. This film set to be judged at the 2001 Sundance Film Festival. Also this year, Le was the subject of a feature for The Discovery Channel titled "On the Inside: Martial Arts." In 1998, Le's UsH! fight team brought home four gold and two silver medals from the Sanshou Nationals, in Baltimore, MD. Le has since opened a second school in Santa Clara and has expanded to a larger San Jose location at the end of last year to accommodate the growing number of students. Le is also the guiding force behind popular line of sports attire and accessories, UsH! Gear which is sold direct, through retailers and on-line. UFC Veteran Carter started wrestling at 12 years old. He was the smallest kid and everyone around him was a basketball player. Some of them are in the NBA now. Michael Finley, Sherell Ford. They were big! They were dunking from the free throw line as freshmen. Due to his size he tried out for wrestling and loved it. He still competes in wrestling. "This will be my 16th year wrestling. I was a collegiate All American at Junior College, made 2 collegiate world teams, and did the Olympic trials in 96." He also trained Judo with his uncle and his dad. "At Carson-Newman College I found out they had a Judo team and I was like, "Ooh, I still know how to throw people with a gi." He joined the club and excelled really quick, winning a couple of state and regional titles. His instructor sent him out to University of Tennessee to work out with their Judo team and he also did Jiu-Jitsu there. He was doing wrestling practice, Judo practice, drive 30 miles to University of Tennessee for more Judo, come back and go to weight training. On training in Judo, Jiu-Jitsu and wrestling simultaneously: "I've always considered them hybrid cousins. Jiu-Jitsu emphasized submissions, wrestling emphasized control, Judo, along with Greco Roman, emphasized throwing. It all really worked well for me." On how he started competing in MMA: "I was in the dorm with all the athletes. Where the wrestlers, the football players, the basketball players all stayed at. They would see me in my Jiu-Jitsu gi and they would challenge me to do matches. I told them we could not do it in the dormitory hallway so they set up their own mock UFC tournament. It was funny because I felt unfair fighting the guys because they didn't know what I was doing. They coerced me into doing it and I basically choked everybody. Then they signed me up for a tournament called Hybrid Street Wrestling. I just blazed everybody because I was still an active wrestler where most of the guys used to wrestle. It all just seemed to fall together in one spot." On incorporating striking: "The first time I fought in the cage, I lost my very first fight to Laverne Clark. The very next day I registered with the United States Boxing Association. Ever since then I have been boxing and kickboxing. Different styles sort of cling to me and it's always a challenge." Shonie regularly competes in MMA, kickboxing, Shidokan, San Shou, wrestling, Jiu-Jitsu, Judo, Pancrase and boxing. "Why I do it? I enjoy competition. It's fun. I want to be considered a consummate martial artist. They say Frank Shamrock is a complete martial artist. I want to go beyond that. Yes, he can punch, he can kick, he can take down and get submission in a NHB venue really well. He's proven himself, but I want people to say, "Shonie Carter can go to a Judo match and win, go to a Jiu-Jitsu tournament and win, do any style of kickboxing and win. Do boxing and win. After the UFC, I'm boxing in the Golden Gloves. I want to be able to say that I'm a consummate, complete martial artist with an eclectic or hybrid style that's proven effective. I can do ANY type of fighting style, that's my mentality." I've promised myself I am going to put forth the best performance I can possibly give. I am going to give you an exciting match. Win, lose or draw you are going to be clapping." Shonie claims a 45-5-5 MMA record. "The title means everything to not just me for myself, but others as well. My two schools; All-American Academy of Martial Arts, and Chicago Fitness Center (Shidokan Hombu Dojo), my daughter Sierra, my unborn son Marcelle. My training partners, Rolando Higueros, John Welch, Brian Gassaway, instructor and master instructor, Robert C Schirmer, and Shihan. Eddie Yoshimura and Sensei Bo Medenica of the Shidokan Center. I have to give a special thanks to Dean Deallassandro for preparing me for this as well. I almost forgot TshortyB. Steele, who is 37-9-2 with 28 wins by KO/TKO as a professional, currently holds six championship titles. He was born in Vietnam and moved to Hawaii when he was 3. He grew up admiring the martial arts and realized that the prospects for a career in kickboxing in Hawaii weren't very good. So he moved to Los Angeles in 1993 and turned professional shortly thereafter. "I'm very confident -- not in a cocky way, but in a way that I feel that nobody will get in the way of what I have to accomplish," he said. "I'm not going to take anyone lightly. When you get too confident, that's when (bad) things can happen. It's happened before, so I'm not taking anyone lightly." Steele currently holds 2 IKF World Titles, one in MuayThai Rules and the other in International Rules. San Shou will be no stranger to him though having won several times in the original DRAKA system. Steele has also tried his skill in some mixed martial arts in Japan as well. No matter what the rules, we're sure to see a war with whoever faces him. Matee Jedeepitak is the Ranked #1 in the IKF Pro MuayThai Rules Rankings. He's a Former Featherweight World Champion of Thailand and considered one of Thailand's best fighters. His nickname "Left Dragon Leg" was coined after the many knockouts he has delivered with that leg. His fight record stands at 123 wins, 52 loses, with 38 wins by KO/TKO. He was Born in Saigon, Vietnam and raised in Hawaii. His Hometown is Ratchaburi, Thailand but he is currently training in Indianapolis, IN, USA. Rudi began martial arts in Boston with Yao Li learning traditional Kung Fu. In 1986, when he was only 13, he traveled to China for extensive training with the Beijing Wushu Team. In 1996, after 10 years away from the martial arts, he returned to focus on fighting. Training under Jason Yee, Rudi began studying the Chinese art of Sanshou. As an amateur Rudi won 3 national Championships as well as a selection to the US National Team. In 1998 he took some time off from fighting to pursue some of his other interests in martial arts. Migrating to Vancouver British Columbia he studied internal Wushu and Qigong with renowned Master Liang Shu You. 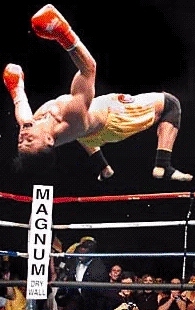 In 1999 with the inception of professional Sanshou Rudi resumed his fighting career. He currently trains with, three time World Champion and Sanshou's top fighter, Cung Le in San Jose California. Under Coach Cung Le, Rudi has become a more versatile and dangerous fighter. He currently holds the IKF San Shou U. S. Middleweight Title and has been selected to the US National Team for a third time as team captain for the 2001 World Championships. As one of the main instructors for the UsH! Fight Team, Rudi has solidified himself as one of the top Sanshou fighters in the United States. Previous to April, 2000, Peter Kaljevic was once a USKBA Full Contact rules Super Middleweight United States Champion. That is, until he lost it in April of 2000 to the person he won it from, Tony "TNT" Ventura. After seven action packed rounds, the judges scored it 68-67 (Ventura), 69-69 (even) and 68-66 (Ventura). Immediately after the bout, Kaljevic asked for a rematch but he has yet to be granted one. Kaljevic also won the USKBA Super Welterweight International Championship as well. The surprise though is Kaljevic's Mixed Martial Arts experience. Although San Shou won't let him fight on the ground, he hopes to show his throwing skills to everyone. D'Wayne Wiggins, (Right) top neo-soul/R&B vocalist, composer, arranger and producer, announced today he will be headlining the United for the Children half time show on Saturday, December 15, 2001 at the San Jose Event Center, San Jose, California. "This is a terrific event that I am proud to be a part of," said Wiggins. "United for the Children is THE event that puts R&B, Hip Hop, and live martial arts at center stage. It also carries the important message that we care about our communities and our children during the holidays and all year." As a member of the Tonyies, Wiggins co-wrote movie tracks for "Boys in the Hood," "Beverly Hills Cop III," "The Mask," and "Panther." As a soloist, his soundtrack credits include songs for "Sugar Hill," "Men in Black," and the TV comedy hit "Living Single." He now adds Movie Producer to his list of titles, as Executive Producer for the feature film "Me & Mrs. Jones". The film is scheduled for release in 2002 and stars Brian White, Wandachristine, Victor Williams, and Kim Fields. Considered the creator of "neo-soul", Wiggins deftly combines classic soul vocals, a live band, and a distinct lack of studio-created sounds, making his on-stage performances very personal, unique experiences. His performance is going to be the highlight of United for the Children. "Having the support of artists like D'Wayne Wiggins is what this event is all about," said Cung Le, (Left) Martial Arts superstar and coordinator for United for the Children. "This is truly an event that brings together all the world of music, athletics, and Hollywood." Benefiting the Marine Toys for Tots and the Twin Towers Orphan Fund, United for the Children will be a spectacular evening of live music, pyrotechnics, and world class martial arts as Cung Le challenge Shonie "Mr. International" Carter (Right) for the IKF World Title. With the support of corporate giants including G-Up, Hyatt Hotels, and ClearChannel Wild 94.9 FM, United for the Children will be THE event of the Holiday Season. Tickets are available online with Tickets.com and Bass. More information about United for the Children is online at www.unitedforthechildren.com. 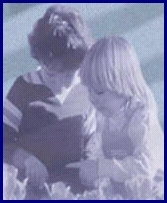 or see this page on the IKF web: United for the Children.